these cozy colorful slippers are a “Kick” to knit and wear! 1 skein Blue Moon Fiber Arts “Llama Loopy”. For added glitz try Anny Blatt “Muguet” or any of the novelty yarns that you may have lying around. You will need approx. 80 yards. Size: Women’s Small/Medium = shoe size 6-9; Women’s Medium/Large = shoe size 9-12, directions will be in ( ). note: The embellishments used for the slippers in the cover photo are done in the Twisted yarn in the Carbon colorway. They are from Nicky Epstein’s books, Knitted Embellishments and Knitted Flowers. 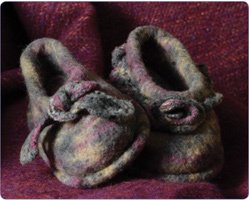 These embellishments are knitted and felted separately and then attached to the slippers. note: Our pattern download service is not instant. Once your payment is processed, a link to this pattern will be waiting for you in the "My Account" section of the website. When that link has appeared, you can get it by following the instructions below. Right now, our system takes 24-48 hours to generate the pattern link(s), so don't panic if it isn't there right away. It will be. This is a new feature for our site and we appreciate your patience as we get it up and running. If you have any problems, please contact orders@bluemoonfiberarts.com. We will be checking each weekday morning to verify the links are being created.